Good question. A script in this case won’t always work. This is because with Vista, Windows 7, and 2008 the print spooler folder is restricted. Only the system account can access it. A way around this is to use our Network Administrator tool. It will remotely execute the script in the system account context. .shd, and .spl files are print job files. If you delete them, it will wipe away any pending jobs. 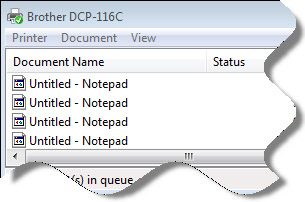 Using Network Administrator to do this is quicker than manually deleting the jobs since it does not have to talk back and forth with the printer driver to do it. The free version is free for commercial and personal use. No spyware or adware – only software goodness. Wow. What a cool tool. You have no idea how much time this will save me. I just tried it here on our network and it works great. We purchased Network Administrator about 6 months ago. Will we be getting this as an update? Hi guys. First, I just purchased a copy of Network Administrator. Second, you just saved me hours of time. I am constantly dealing with crusty printer drivers. 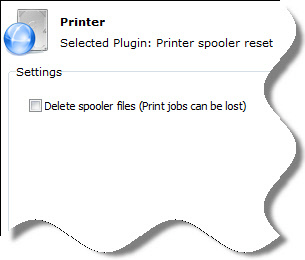 The jobs always get stuck, it is so annoying to have to remote in and navigate to the printer to clear them out and start and stop the spooler. This makes it a piece of cake. Thanks for the order John, we really appreciate it. Glad it helps you save time! Many thanks steve for this plugin. I too have needed this in the past. These little plugins all add up to one great tool. Thanks for the kind words Abdul. Thanks for the order too. Once again Steve and the IntelliAdmin guys save the day again. I actually wrote my own tool for this a little while ago as I needed in my enviroment, didn’t even think about suggested this for Network Admin. Great work, I will also test out that new plugin on the 3rd of Jan when I return to work. Thanks for the Christmas Present Steve. This happened to me again today. I have had to deal with this issue for *years*. Finally an easy way to clear it and get the printer rolling again. Thank you for the kind words. Mark and CyberCitizen. We really appreciate it. Great tool. I never saw the need for your Network Administrator. It does mostly things I take care of with Group Policy. This one takes the cake. I am constantly fighting with the spooler on my 2003 print server. I will be using this as soon as I get back to the office next week. Thanks Smitty. Feel free to email us at support@intelliadmin.com if you have any questions. Just got into the office today after the Christmas holiday. Got a call from our sales staff that the printer was jacked up again. 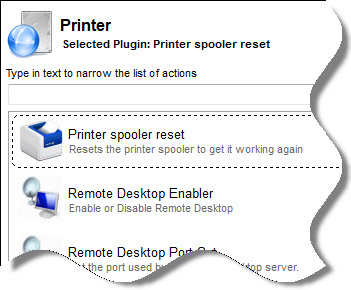 Used Network Admin to reset the spooler in 5 seconds flat, and they were printing again. What an awesome addition to this great tool!